Start your review of John McAvoy. Dileep was a pleasure to work with and did everything he could to make my deal work including getting Nick into the office a couple of times to sign off. Dileep fulfilled his commitment to me and delivered the vehicle on time and was a true gentleman. I would recommend him as someone you would want to do a deal with. "Thank You to Cassidy & Nik Jr"
It was nice to walk in to a roomy dealership. 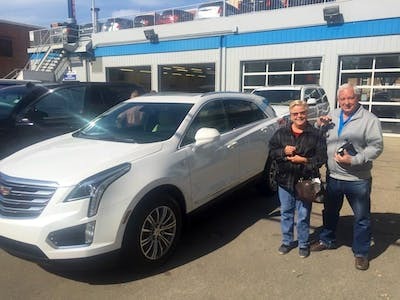 Cassidy was very knowledgeable, I had not given any thought to buying a Cadillac in my 4 months of vehicle shopping so I give Cassidy a lot of credit for how helpful he was. I didn't have to listen to "how great this dealership was and their great ratings etc" as I heard from other dealerships. It's been quite an experience for me as a single senior lady. 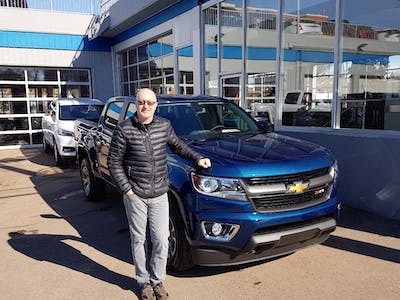 Test driving a suv with sold sign in window but "no that doesn't mean anything " 2 hrs later I'm told "sorry it's sold but here is another one" a lot higher price. Thank you Cassidy & Nik Jr your honesty and professionalism was appreciated, no other dealership could I say came anywhere close! "Excellent service and exceptional knowledge from staff"
I would highly recommend the don Wheaton crew - they were quick, eager to please and friendly to deal with. I will continue to use the dealership for new purchases and services too. "My beautiful new truck! " Brandie was patient and thorough. She worked hard for me and found me the perfect vehicle! I couldn’t be happier! She and Mellissa made me feel like the most important person they were working with and had my truck ready and waiting for me! I will for sure be sending my friends and family for all their vehicle needs! I’m looking forward to my upcoming first service visit with John McAvoy! "Not my first purchase here. Won’t be my last"
So every car I buy I go see Brandie. She has always treated me very well. Just recently I was borrowing my dads SUV while running errands and got t boned. His car was a write off. Car shopping we go. Having never gone elsewhere and dealt with anyone but Brandie I decided I would test it out. Headed to City Ford after hearing all the commercials of sales and such. Walked into new car showroom. Was approached by a salesman. Told him my monthly payment I was looking to spend and he sent me to used sales. The used salesman showed me a selection of maybe five cars that were in my budget and kept telling me I need to up it. After saying no I selected the best vehicle for me and sat down to work out numbers. I told him my friend works at Chev so no messing around. And that my dad will be looking too. So two sales. Didn’t budge from sticker price. I said thank you I will be in touch. Now this sales guy kept pressuring me to put down a deposit. This car is hot and will be gone. I said no. I’m ok with taking the risk. Walked out. Sent a message to Brandie that I was headed in and want to check out the Cruze. She had two different ones lined up for a test drive and three different pricing packages set for me to review within the hour. Under budget and brand new. I drove it. Saw the one in the showroom. Loved the colour. She had it in the shop. Gassed up and ready when I wanted it and even picked up the plate from registries. I knew going to City Ford that I would end up at Don Wheaton but I had to see what other people go through. I feel bad for them. I did call the salesman to let him know I am buying a new Cruze and will not be back. I got a text within the hour that his manager dropped the price $2k. I said no thank you. Now I have my new wheels and my dad is picking out a Cruze hatchback. I won’t bother with the shop around again. Just a headache. "A Team from begining to delivery"
First of all, we have worked with General Manager Dave Mussell, and truly understand how a team is built; it starts at the top. Thank you Dave so much for introducing us to Brandie! We first spoke to Brandie regarding a used truck or a price range we wanted to stay in and she spent time researching this for us so she had vehicles within our budget. We took one used truck for a test drive; realized that we wanted a new truck. A friend, as did my son, said to me that we needed to look at the Canyon Diesel that it has such great reviews. So, switching plans on a dime we told Brandie this and like a pro she asked her assistant Melissa to call to find the one in stock for us to test drive and Melissa immediately took care of this with such pleasure! We then had the truck delivered by Tia with such a smile and knew that she was so happy to do so (we saw Tia at reception when we went to pick up our truck and again we saw her interacting with others with that same enthusiasm). We are so grateful that Brandie had such patience with us on the delivery of our truck as we have never owned a truck let alone a diesel and Brandie knew this and took the time to ensure before we left that all of our questions were answered and we left with knowledge. Thank you Brandie!!!!! We can not forget the VP of first impressions Melissa the receptionist; she makes all feel so welcome :)! Along with John in service and Jason in finance, the consummate professionals :)!